To start 2016, a vision. In 450 events in 14 countries, I’ve heard a lot of thoughts about healthcare: its challenges, its possibilities, why change is hard, and who should do what to make things better. Easily one of the most inspiring voices I’ve heard is Victor Montori at the Mayo Clinic’s “KER Unit” (Knowledge and Encounter Research Unit). Here are two resources to briefly introduce you to his work; another will come later this week. One of his fundamental principles is what he calls “minimally disruptive medicine.” While so many articles in magazines and journals complain about patient “compliance” (i.e. doing what the doctor dictated), the KER people are nearly obsessed by questions like “Will this work in the patient’s life? ?” and “Wait – is this what the patient really wants?” A great quick overview is on their home page. We are really obsessed with the question: What is best for me and for my family? From this question stems the others that require a joint understanding of what is the patient situation that requires action; what are the actions that are available and sensible and address the patient situation in a manner that fits their context and reflects what patients consider important and the reasons they have to value such things. That’s distinctly different from people – including insurance companies – who feel the patient should get whatever the literature says. In the KER view, the evidence is one input into patient-oriented decisions. “Will this work in the patient’s life” is the Capacity part of the diagram above. 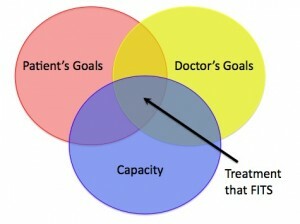 The right care, they feel, is found in the intersection of what both parties want and what is feasible. That may sound obvious to you but many patient stories involve being told to do things that just aren’t practical – and many provider stories involve being told they’re not allowed to prescribe based on patient needs. I believe this is how care should be carried out. I believe any effort to improve any aspect of care delivery will miss care’s potential unless it’s planned in this context. This intersects nicely with what I call the pre-mortem question: not waiting until the follow-up visit to find out what has gone wrong, but asking the patient after we have come up with a plan, what problems he anticipates and what we might think about doing to make it easier to succeed. “Pre-mortem” — love it, Peter! And yes, Dave, you are right, KER was way ahead of its time, foreshadowing now when a “good” MD would feel obliged to consider a patient’s particulars in context too. That whole equation is been doing a slow flip the last half decade or so, it seems to me. Back when I served on a telemedicine committte, circa 2008, the onus to adapt was still on the patient, not the MD.